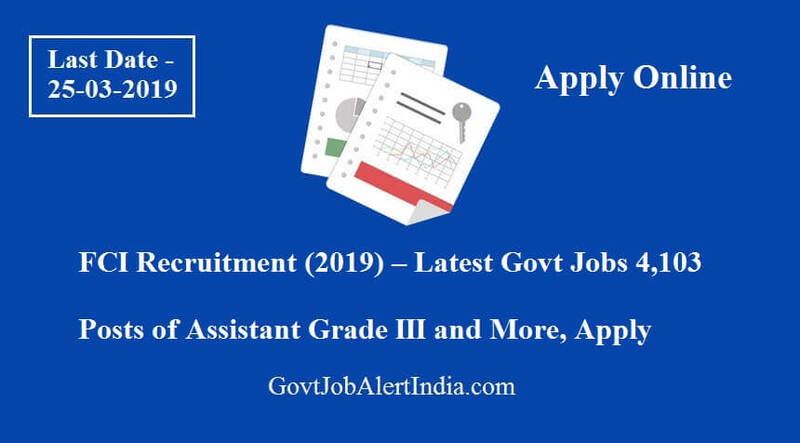 Food Corporation of India (FCI) has announced a Latest GovtJobs notification for 4,103 posts of Assistant Grade III and more. All the candidates who are interested can check the vacancy details and apply online from 28-02-2019 to 25-03-2019. For Assistant Grade III (Depot): Candidates should have passed Graduation Degree in any discipline with proficiency in computers. For Assistant Grade III (General): Candidates should have passed Graduation Degree in any discipline with proficiency in computers. Selection Process: Selection of candidates will be made on the basis of Online Test and Skill Test. Application Fee: General/OBC candidates have to pay Rs. 500 through online mode using Net-banking/Credit or Debit Card. Ex-Servicemen and SC/ST don't have to pay any fee. How to Apply: Interested and eligible candidates may apply online through FCI website - http://fci.gov.in/ - from 28-02-2019 to 25-03-2019.